MIT researchers have created a polymer fiber-based camera that could potentially be lightweight and foldable. When light hits the semiconductors, it displaces electrons within the material, creating an electrical current. The intensity of this current from the fibers is input into algorithms, running on an attached computer, that create the image of an object placed near the sheet of fiber. [Fabien Sorin, the postdoctoral researcher who developed the fiber camera] says that the next step for the MIT team is to build more layers of sensors inside the fiber, which can be used to re-create images with multiple colors. Adding more layers is doable but could be challenging. 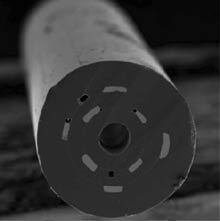 "As you put more layers inside the fiber, it becomes harder to keep the cross section uniform," Sorin says. His eyes roved the ceiling and walls. He found what he sought: a glittering fractal spiderweb just under the great orange bulb at the apex of the dome. Chmeee said, "We have a spy. I thought as much, but now we know it. The puppeteer placed cameras among us."